SIR, Apropos the report, ‘Plan Panel draws flak’ (25 July), the definition of poverty is not the matrix but the politics that determines the distribution of subsidies. Democracy is majoritarian rather than egalitarian. Therefore, politicians prefer short-term measures such as subsidies, job reservations, and transfer of assets to long-term programmes, such as acceleration of GDP, growth of productivity, investment in education etc. No wonder democratic countries have been sluggish in alleviating poverty. Poverty estimates are used by policymakers, particularly the Planning Commission and the central government, as a factor in the transfer of resources to the states under the Gadgil formula. The Centre tends to underplay poverty, while the states and opposition parties keep the numbers high. It is this disconnect that has sparked the debate on poverty The guiding objective must be to monitor the progress in addressing destitution. But this is criticised on the ground that the Planning Commission sets the poverty lines so low that many could be excluded from getting the benefits of social welfare schemes. Poverty line expenditures have been traditionally set at levels just sufficient to allow above-subsistence existence. So instead of arguing in the abstract about what the poor would or would not buy, the critics need to examine the basket of goods that people in the BPL category had bought in 2009-10. The Planning Commission should discontinue the practice of publishing the centrally-defined official poverty figures. 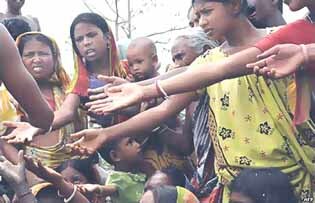 Instead, it should simply publish the distribution of population in accordance with different expenditure categories for the purpose of identifying the beneficiaries of anti-poverty programmes; and if any state wants to opt for higher poverty lines it can go ahead and generate resources to assist the poor as the Chief Minister of Bihar, Nitish Kumar, did with the distribution of cycles among school girls. Of course, for inter-state transfers, the Planning Commission could follow its own poverty line. SIR, Trinamul Congress has defeated the Left Front in rural Bengal. Mamata Banerjee has hailed the triumph as a "victory of democracy". On the other hand, Biman Bose, state secretary of the CPI-M, calls it a "victory of atrocity". The violence that has roiled the state over the past few months has been widely reported. Besides, Opposition candidates were prevented from filing their nomination papers, their agents barred from polling booths. In many areas, voters were attacked. There were complaints of booth-jamming, rigging, the passive role of the police and immobilization of central forces. The observers were not always active. Even a presiding officer was attacked and severely wounded. Altogether, it a travesty of democracy; free and fair polling was a hoax. If a panchayat voter is denied his constitutional right to vote, democracy is in danger. Bengal now contends with a fractured democracy. How can this be misconstrued as a victory of the concept? It is a victory of atrocious democracy. SIR, This is with reference to your well-written editorial, ‘Middle Bengal’ (1 August). The victory of the Trinamul Congress in the panchayat elections has reinforced the people&’s faith in the leadership of Mamata Banerjee. Under her leadership, the party has made inroads into the CPI-M bastions and also in North Bengal where once the Congress reigned supreme. The terror tactics unleashed by the CPI-M during its 34-year rule still haunts the people. They fear that the party might once again adopt a similar strategy if voted to power. The Congress has been routed. I endorse your comment ~ “It would be overly simplistic to aver that the collapse of the parallel rural economy, the Saradha scam and the spate of suicides have scarcely been able to dent the ruling party&’s standing.” The state government must now revamp the villages and raise the level of literacy. The villages ought to be made self-sufficient and the crime-rate reduced. Above all, rural Bengal needs to be industrialised to generate employment opportunities. SIR, This is with reference to Shoma A Chatterjee’s tribute to Uttam Kumar in The Statesman (Marquee) on 20 July. She has written that Tapan Sinha had directed Uttam Kumar in Bicharak and Hansuli Banker Upakatha. The fact is that Bicharak was a film made by Prabhat Mukhopadhaya. Further, Uttam Kumar did not appear in Hansuli Banker Upakatha.